EHRs add a layer of complexity that smart organizations will address well before requests arrive. EHRs may be driving improvements in clinical workflows and care quality, but the same cannot be said of their impact on hospital processes for responding to subpoenas and other legal discovery demands. If anything, the growing prevalence of EHRs has created entirely new headaches when it comes to compliant electronic discovery. For example, the question of whether a record is complete is complicated by the fact that bits and pieces of data are scattered across multiple IT systems, mobile devices, etc and exist in multiple formats. Because images and reports may be coming into the EHR from partner facilities and telemedicine consultations that impact data ownership, it is often difficult to determine a record’s custodian. Then there is the question of what exactly makes up the legal medical record. Depending on where a hospital is in its transition to EHRs, the legal record could actually be a hybrid of paper and electronic files. It may also include items such as electrocardiograms, scans, and fetal monitor strips. 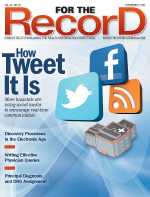 These issues barely scratch the surface when it comes to identifying and resolving discovery challenges in the age of EHRs. The sheer complexity of the process is one reason many hospitals are ill-prepared to deal with it. “Hospitals, like many other organizations, have been basically ignoring this whole issue. They wait until they get that subpoena or notice of deposition and then start scrambling. That’s the wrong thing to do,” says Steven J. Fox, a principal with Post & Schell, PC, who chairs the firm’s IT group and cochairs its data protection group. The right thing to do, according to Fox, is to have iron-clad policies in place that define the legal medical record and establish how and when data are saved or deleted. It is also crucial that the entire staff is aware of and adheres to these policies to avoid any unexpected surprises during e-discovery that could impact the outcome of any litigation. When it comes to defining the legal medical record and developing policies that dictate how it is maintained—in particular with regard to data retention—the best approach is a committee that includes representation from all departments involved in the creation, maintenance, storage, and deletion of any or all parts of the record. At Trinity, which defines its legal medical record as any data that print from a patient’s EHR, the policy committee includes legal, HIM, privacy and security, EHR, and IT. Each of these departments brings a specific knowledge regarding the medical record and the IT system that is crucial for ensuring the creation of a comprehensive retention policy. For example, EHR, IT, and HIM contribute expertise specific to the definition and management of metadata, which are typically requested as part of e-discovery. Major metadata are the date-and-time stamp reflecting a record’s creation, the author’s name, the date and time of any amendments or corrections, and the various versions resulting from those changes. Minor metadata include physician tables and the date/time a document entered the system interface. Other significant challenges a committee must address are determining the information’s origination, what formats it appeared in, and where it is going within the EHR. It’s a challenge exacerbated by the rise of mobile computing and the growing use of e-mail and instant messaging as primary forms of communication between physicians, patients, and clinical departments. As a result of this trend, pieces of the legal medical record aren’t necessarily limited to the actual EHR system. They may be stored on smartphones, tablets, or thumb drives. They may also be backed up and stored off site. All these concerns need to be addressed in the e-discovery policy. In a perfect world, policies defining the legal EHR and data retention for e-discovery purposes would be developed before or in conjunction with system planning and implementation. Unfortunately, given the magnitude of EHR planning and implementation and the resources required to ensure it goes smoothly, e-discovery issues are pretty low on the priority list—if on the list at all. Plus, even with a “big bang” implementation, it’s highly unlikely that every department will be online at the same time. That was the case at Trinity, which underwent a systemwide EHR rollout in 2006. According to Nelson, prior to implementation, it was difficult to define all the components of the electronic record or understand department-specific practices that could impact the final legal record. Attempting to set e-discovery policies into stone at that point would have been impossible. Thus, many hospitals are forced to find a way to create order from chaos after deployment. And given the rapid rate at which new data are created and exchanged, it’s a situation that can quickly spiral out of control. That is when some facilities find it beneficial to bring in an outside vendor to help them ferret out all the data that exist within the system that they will likely be required to produce in e-discovery. In some cases, this can’t be done until old data are converted into a readable format. According to McGann, a common problem for hospitals is retaining too much data for too long. In some cases, technology has advanced to the point where it is no longer possible to “see” what information backups and archives contain to determine whether they may be subject to e-discovery. In other cases, the problem stems from IT and legal not communicating with each other about what needs to be retained, in what format, and for how long. Often, the data protection policies that IT follows conflict with proper legal procedures or they have not been updated to reflect changing compliance requirements. Using an indexing service to extract and tag data is a cost-effective way for hospitals to see what they have and determine what needs to be retained and what needs to be purged. It also helps organizations better understand the kinds of electronic data they have so policies can be refined to streamline e-discovery. In addition to knowing where data subject to e-discovery reside and having clear retention policies, healthcare organizations must create procedures dictating how e-discovery is processed. In particular, hospitals should have an organizational structure that clearly defines who is in charge of receiving the request and who is responsible for handling information collection. As with policy development, these procedures are best designed and carried out by committee—a sort of formal response team for litigation—that at minimum includes representation from legal, IT, and medical records. This committee should meet on a regular basis to review existing policies and refine them as necessary. This way, “When notice comes in, they are not scrambling. Everyone knows who gets it because it is in the policy. They can immediately act on it,” says Fox. Also imperative is that the policies and procedures be disseminated to all employees who may need to know what to do when a record is placed in litigation hold, meaning it cannot be changed in any way. Nelson concurs, noting that ignoring the issue until notice is received will serve only to expose the facility to significant legal risk. As the volume of data increases and the systems and devices used to access that data multiply, hospitals without airtight e-discovery policies and procedures in place will find out the hard way that the cost of noncompliance is far higher than the price of prevention.